"Worsley Works Irish for a Growing Range of Irish Model Railway Kits"
The resurgence of interest in the railways of Ireland has resulted in the appearance of more Irish layouts at model railway exhibitions. 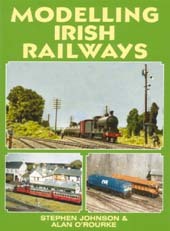 Modelling an Irish scene is more challenging than embarking on yet another layout of a GWR branch terminus, but as this book demonstrates, it is not beyond the prowess of most modellers and can provide a great deal of interest and fulfilment. Individual chapters look at how to create both broad and narrow gauge layouts with information provided on how to modify proprietary items, where to find kits and on scratchbuilding. Layout plans offer a range of ideas, based on prototypes, from a simple single track station to more complex junctions and locations where both broad and narrow gauge lines converged to create a mixed gauge layout. Fully illustrated throughout, this is that rarity, a railway modelling book which covers genuinely new ground and offers modellers a fresh direction in which they can channel their expertise.